It's Important That You Read Your New Carpet Warranty. Strongly colored natural dyes as in mustard, teas and other hot beverages. Substances that can destroy or change the color of carpets such as bleaches, acne medications, plant fertilizers, drain cleaners, and plant food - to name a few. What type of anti-stain coverage do you have? As if its not confusing enough, you need to know that the Fiber Manufacturer is who actually provides the stain warranty to the consumer. Contact the following fiber manufacturers for further information on care and cleaning and limited stain warranties for your specific carpet as specified by the warranty page. The companies who provide the Topically Applied Stain Treatment may also be involved in a warranty claim if there is a problem related to staining. This might include products like Scotchgard® or R2X. If you have Carpet Stain Warranty questions you can call the fiber manufacturer or directly to get answers to common customer concerns. Have You Read Your New Carpet Warranty? I hate carpet warranties. They are all terrible. It's an eye opening experience to read any new Carpet warranty. There are so many limitations and exclusions, it's easy to see that they word it in such a way to make it very difficult for homeowners to substantiate a valid warranty claim. You must follow their care and maintenance instructions and requirements to the letter or risk voiding the warranty. I've read just about every carpet warranty and they all say that you must be able to prove that the carpet is defective in order to get a remedy. If your carpet does not perform as well as you had hoped then they will likely assume you have selected a carpet that was not capable of withstanding your level of foot traffic. If you abuse your carpet in any way, like not vacuuming enough, or vacuuming with the wrong vacuum, it can also void your carpet warranty. If you have pets that are not housebroken, your warranty is shot. From what I have witnessed over the years, the carpet manufacturer can deny your claim for any number of reasons, and they usually do. Warranties expressly exclude fitness for a particular purpose. That means if you choose a carpet that is not designed withstand your level of foot traffic, you will have no warranty coverage if it wears out too fast. Most warranties also exclude matting and crushing. Read what the manufacturers warranty limitations are, what your responsibilities are and keep an eye out for sneaky terms like "Affected Areas Only" or "Reimbursement Limitations". "You are required to have your carpet professionally cleaned every year or two or you will void the manufacturer's warranty?" "I purchased a carpet almost three years ago. The carpet from year 1 has matted. The twists have come out in the heavy traffic areas. I called Home Depot 3 times over the past 2 years and was told nothing could be done about it. This last time they finally filed a complaint (with the manufacturer). They asked for my cleaning records which I didn’t have. They would not even look at the carpet. I was never told about this when I purchased it and it is not written anywhere on my receipts. I told them you get a written warranty on almost all products on the package. You get a written warranty when you buy a car or appliance. Why are carpet manufacturers able to get away with not giving it to consumers at the time of purchase. I was told it was on the back of the sample. I guess we are to take a pencil and paper and sit down and write the warranty out ourselves." Even though I don't put much value into any new carpet warranty, you still should follow the carpet care instructions to the letter. It will ensure your carpet will last as long as possible. Sadly, most homeowners never receive a copy of their new carpet warranty from the retailer. Now that you know this, be advised that it is your responsibility to ask for, and obtain a complete copy of the manufacturers warranty for the type, grade, style and brand of carpet you have purchased. If the retailer never gives you a copy, and you fail to comply with all the rules and requirements outlined in the warranty, you can't go back and blame the retailer when your warranty claim is denied. On the other hand... If you do get a copy but you don't take the time to read it and follow the proper care and maintenance instructions, don't be surprised when your warranty claim is denied. Visit my Carpet Care Page to learn more about how to properly care for your carpets. Q. What Are Carpet Reimbursement Limitations? If you can substantiate a valid claim with a carpet manufacturer or fiber manufacturer, they may pro-rate your reimbursement amount depending on how old your carpet is when your carpet claim is filed. Not all reimbursement schedules are alike, some are better than others. Some schedules cover a span of 15 or 20 years. You may be responsible for paying for all additional costs involved including shipping charges, delivery fees, removal of your old carpet, recycling fees, disposal fees, furniture moving and installation of the replacement carpet. The Carpet Manufacturer provides the part of the warranty that covers Manufacturing Defects. If you suspect a carpet defect is the problem, contact the dealer where you purchased the carpet and ask them to come out and inspect your carpet. They will determine if the issue is defect related and will contact the carpet manufacturer for you. 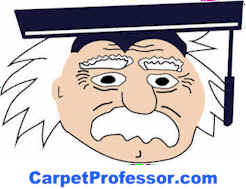 The manufacturer may send a representative or a carpet inspector to evaluate the carpet problem. This process could take weeks to complete. Be patient. Written description of the carpet problem. Photos of the carpet problem. This is a partial listing and they change their numbers frequently. Do a Google search if your brand is not listed here. See my Carpet Care Guide - How to make your Carpet last longer.